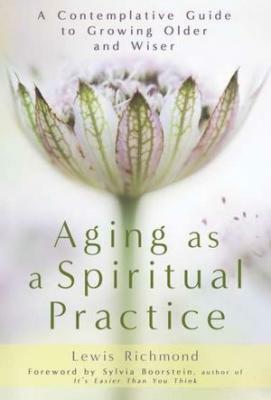 The bestselling author of "Work as a Spiritual Practice" presents a new vision of the aging process, awakening a spirit of fulfillment and transformation. In "Aging as a Spiritual Practice," Richmond acknowledges the fear, anger, and sorrow many people experience when they must confront the indignities of their aging bodies and the unknowns associated with mortality. This wise, compassionate book guides readers through the four key stages of aging- such as "Lightning Strikes" (the moment we wake up to our aging)-as well as the processes of adapting to change, letting go of who we were, embracing who we are, and appreciating our unique life chapters. Unlike many philosophical works on aging, however, this one incorporates illuminating facts from scientific researchers, doctors, and psychologists, as well as contemplative practices and guided meditations on aging's various challenges and rewards. The tandem of maintaining a healthy body and healthy relationships, infused with an active spiritual life, is explored in rejuvenating detail. Breath by breath, moment by moment, Richmond's teachings inspire limitless opportunities for a joy that transcends age. Lewis Richmond is a Zen Buddhist priest and meditation teacher whose three previous books include the national bestseller "Work as a Spiritual Practice." He lives in the San Francisco Bay area. "This book guides us in navigating aging and reaping the blessings of happiness, openheartedness and inner freedom. Lewis Richmond writes from the radiance of his own discovery-he is fresh, clear and wise. I'm recommending this to all my aging friends!" "As someone who recently turned 70, I ate up Lewis Richmond's words on seeing growing older a spiritual practice. The book is fun and enlightening. I'll never forget some of the stories and the sharp formulas the author uses to remember how to age with some pleasure. The Buddhist point of view is especially fresh and useful. There's some Zen in all of us, deep down." "Embedded as our culture is in the fantasy of control and management, our deepest distress rises from being separated from natural process, and our inevitable failure to manage, even defeat aging and mortality. Lewis Richmond speaks to the summons aging brings us, and offers a practical, step by step set of attitudes and practices which open the reader to philosophical maturation, a proactive engagement with the meaning of one's changing state, and the attainment of personal dignity through our shared journey into mystery." "Life can be challenging at any age and spiritual practice can be beneficial at any age. However, as Lewis Richmond makes crystal clear, these benefits may be especially important and valuable with aging." Thoughtful, truthful, loving, Lew helps us bring attention to the mystery of aging with great kindness and wisdom.